Click here to PIN this post to Pinterest so you’ll be able to find it later! This post originally appeared in January 2011. It has been updated to add new photos and update the text a bit. I still use all of these tips regularly so I hope they help you too! It’s time to get organized! Ok, if you ask me, I’m pretty sure there are few people who are actually shouting that on a regular basis. Even so, an organized home can lead to a less stressful home and you can also save time and money when you know what you have and can find it easily. Since I’m all about meal planning, it’s time to take a break from the closets and take a look at your freezer. Organize your freezer you ask? Sure, it will help your meal planning for sure when you know what’s there. I get this question a lot. The answer is “just about everything!” People are surprised to learn that I shred and freeze my own block cheese, cut up fruit, and of course prepared meals ready to pull out, heat and serve. 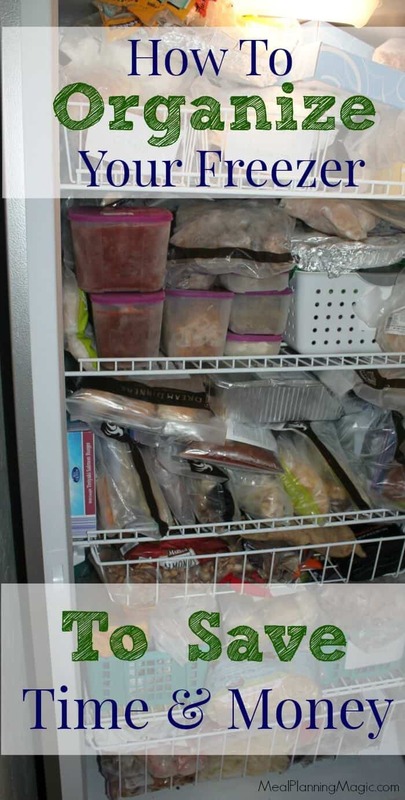 It is recommended that items remain in the freezer no more than three months, on average, to avoid quality issues. Still not sure? Check out these resources to get you started or go here to find even more. To make the most of your freezer space, choose containers that work for you. For some that may mean plastic modular containers. Others like using zip-top bags stacked on end like in a bookshelf. Other items can be frozen in dishes that can go straight into the oven. Personal preference makes a difference too. I like to store liquids like soups in modular containers—they are easier for me to heat and serve. I’m sure I’m not the only one to throw something in the freezer and think, “I’ll remember what that is” only to discover months later that that I did not remember! Or perhaps you will thaw out what you think is alfredo sauce for dinner one night only to discover it is the leftover homemade vanilla ice cream you made this past summer (yep, I actually did that one last week–AFTER it was on the pasta!) I personally love these reusable labels from Label Once. They adhere to a lid and will not come off in the freezer or dishwasher. When it’s time to reuse your container, just erase the contents and date and write on the new information. 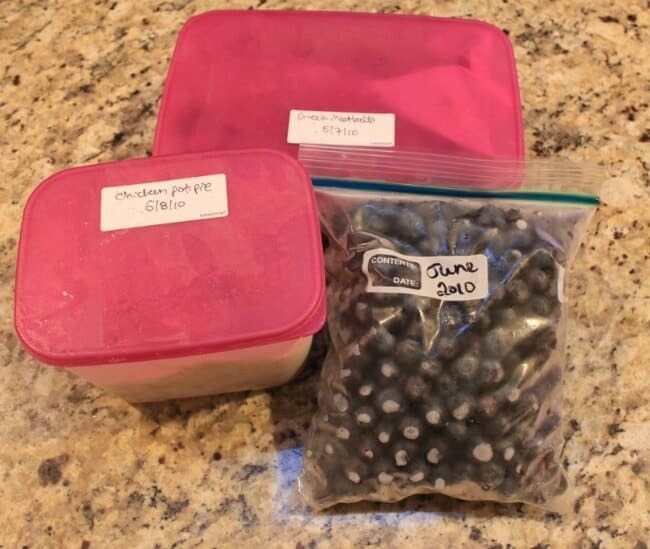 Labeling your ziptop baggies with a marker works great too! Now that your items are labeled, you’ll want to log what goes into the freezer (saving energy with fewer door openings to see what’s in there). I created a form that helps me find what I’m looking for more easily. It has four categories: Prepared Meals, Fruits & Vegetables, Dairy/Nuts/Bread/Other and Meats/Fish. Don’t forget to date it too! 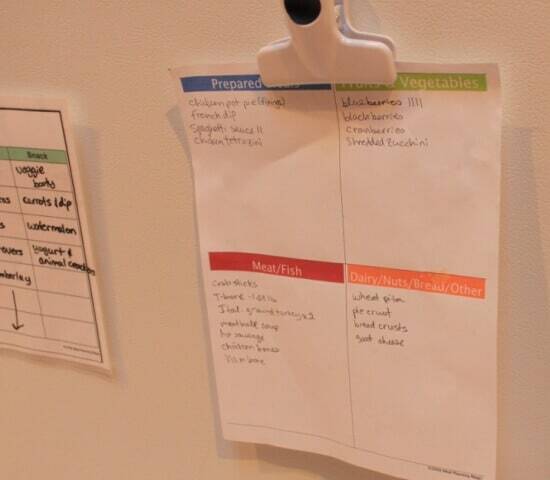 When it comes time for meal planning, just grab your list and scan it to find out what you have on hand and choose your recipe accordingly. Get a copy of the form shown below by clicking here. We have a medium chest-style deep freezer. In it I have some plastic crates to help me organize it into compartments. I’ve divided the freezer into “zones” that correlate to my log sheet. For example, the upper right crate holds fruits and veggies like the blueberries we pick every summer or sliced bell peppers that I got on sale. To help others find things in the freezer, I came up with a diagram taped to the top of the freezer that shows the crates and what is contained in each. It’s easy to get organized in the kitchen when you have a few tricks up your sleeve! On an organizing roll in the kitchen? Check out these other posts in my Kitchen Organizing series. Do you have any other freezer organization tips? Share them in the comments below! We just started logging what is in the deep freeze. Should have done this a long time ago. We use a dry erase and it is hung above the freezer. Works great! Never thought of the map. It makes total sense though! Thanks for sharing. @Shannon, glad you found the post helpful and that you are already doing things to keep your freezer foods from getting lost! @Alison, oops! Forgot to say thanks to you too…glad you thought the tips could help you too! This is great! 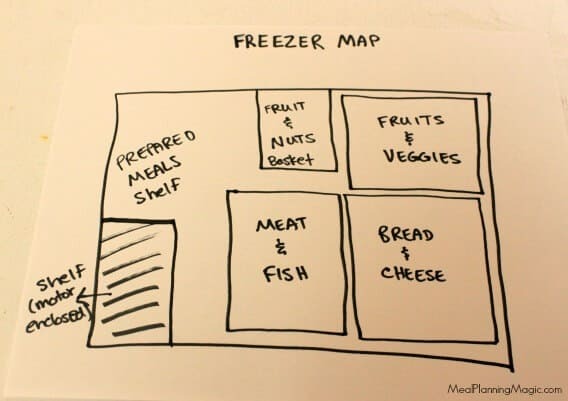 I really like the idea of a freezer map. Especially for chest freezers, because I’ve found that it can be frustrating to dig through them to find what’s on the bottom. I recently attached a whiteboard to the lid of my chest freezer with a diagram and expiration dates of the contents inside. It really saves me from having to dig through it!